This issue's Featured Photographer is an old contributor Al Brydon. Al has been intriguing us with his crepuscular concoctions for a while and we wanted to ask him some of the usual questions and get an update on this and his 'two photographers' Holga experiments. Whatever I'm currently working on. Once a project is finished it's finished and I want to move on. I find it increasingly difficult to look back at older work and still remember how I felt about it at the time. Retrospective revelations about what I was thinking can be fairly illuminating and may then influence the next set of photographs. Building upon old ideas and taking them somewhere else seems to have allowed an evolution to the work. Mentally I always feel six months behind each project. I make the photographs then work out why afterwards. “Downgrading” to the Holga (toy camera with a fixed focal length plastic lens) was a fantastically liberating experience. The sudden absence of technology forced me to approach landscape photography in a completely different way. One shutter button and a focus ring that seemed to make no discernible difference no matter which way it's twiddled offered a complete oneness with the subject matter in front of me. I found it was something I could apply to my other landscape work with relative ease after a while. The other revelation came from mostly shooting in fairly awful weather conditions. No sunshine or chocolate box photographs, not that I have anything against that type of photography but it just doesn't interest me. 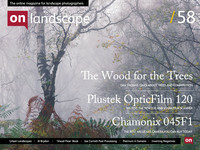 The landscape is a tactile environment, especially on a rainy or windy day. There's so much more going on and the harder I have to work to get an image and the more I lose my sense of humour the more interesting the result seems to me. I want to have to work hard; it should never be easy.